Watch anglers battle giant sea trout in the wild rivers of Tasmania's West Coast, stalk massive tailing trout in crystal clear highland lakes, marvel at the hidden beauty of rainforest creeks and experience a great hatch on Tassie's fabled lowland rivers. More than a century ago the first trout to ever be successfully transported into the Southern Hemisphere were hatched in the Salmon Ponds Hatchery in New Norfolk, Tasmania.....therefore when it comes to fly fishing downunder Tasmania is THE SOURCE. Massive sea trout on the wild West Coast, dry fly fishing in pure rainforest creeks, rafting the fabled lowland rivers and sight fishing the Western Lakes. These chapters form a cinematic adventure, exploring the history, beauty and diversity of the fishery. ""The Source" is about finding quality fly fishing destinations that are a little bit off the tourist map. Tasmania, as a fly fishing destination, has long lived in the shadow of New Zealand. While it's true New Zealand has amazing trout fishing, we wanted to show that Tasmania, on the right day, can match it for wilderness and big trout. Also, more than a century ago, the first trout ever to be transported to the Southern Hemisphere were hatched in the Salmon Ponds Hatchery in Tasmania. The progeny from these first few eggs were then transplanted into countries throughout the Southern Hemisphere... therefore, when it comes to fly fishing Downunder, "Tasmania is The Source"." I really like this movie. I just wish I had that kind of diversity of fly fishing close to my home. 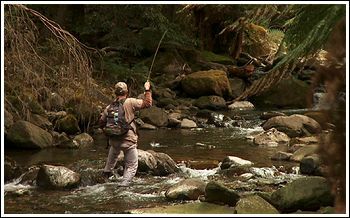 The movie shows the great diversity of what Tasmania has to offer when it comes to trout fishing. All from very tiny rainforest creeks, the Western Lakes greatness, the famous slow lowland rivers to the sea running trout in the river mouth estuaries, all carefully and sensitively filmed. 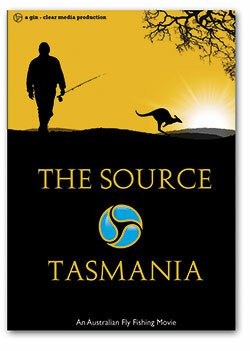 I have always wanted to visit Tasmania since I many years ago first read about the excellent trout fishing there. But in the same time been I'm reluctant to go there for the number of snakes and poisoness spiders crawling all over. After seeing this movie I must say that the call for going there is stronger then my fear of snakes and spiders. The movie is filmed in wide-screen format, and feature both aerial, time-lapse and slow-motion filming. I can't any negative about this this movie, just that it was too short. The movie makes me want to see much more of what this great island has to offer trout wise. So if it was one hour longer I would not mind. 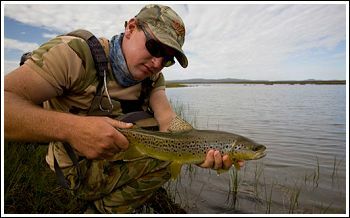 Gin-Clear Media is New Zealand's leading producer and distributor of high quality fly fishing media products. We specialise in global destination-based DVD's and books, that offer adventure, humour and strong stories rather than pure instruction. We strive to produce media that is both original and of the highest quality. © Mats Sjöstrand 2010 If you have any comments or questions about the Magazine, feel free to contact me. Please excuse me if you find misspelled words or any other grammatical errors. I will be grateful if you contact me about the errors you find.